Bangalore is an incredible city in Southern India that is known for its IT, infrastructure, commercial zones, landmarks and tall residential towers. Without a doubt, Bangalore has turned into a concrete jungle today and has a lot to offer its inhabitants. The real estate market in Bangalore is booming today and has a lot to offer. Ajmera Stone Park is a new residential project by Ajmera Realty that offers a sophisticated lifestyle of elegance and class. Extended over luscious acres of land, this development consists of magnificent towers that offer 2BHK and 3BHK luxury apartments that are crafted to delight. The apartment area sizes start from 1075 sq. ft. and go up to 1435 sq. ft., providing beautiful space that you will never run short of! This residential development focuses on luxury, comfort and modern-day living that is truly overwhelming. The apartments are well-spaced and contain stylish fixtures and fittings, vitrified flooring, anti-skid flooring in balconies and utility areas, laminated wooden flooring in master bedrooms, fabulous kitchens with piped gas, dado tiles, granite platforms and multiple provisions, acrylic emulsion paint on internal walls, safety features and the list goes on. 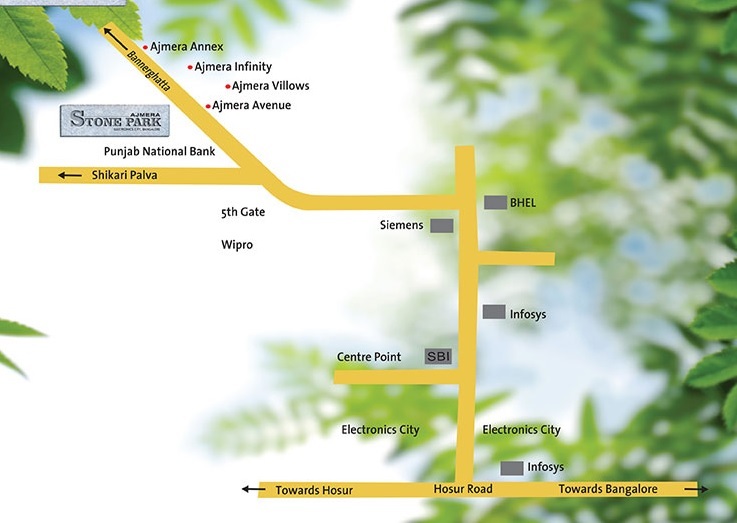 Ajmera Stone Park Bangalore leaves no stone unturned when it comes down to external amenities and offers only the best. The external amenities at this development include a clubhouse, meditation centre, swimming pool, well-equipped gym, swimming pool, multiple sports facilities, play-area for kids, multipurpose hall, landscape garden, Wi-Fi connectivity and wide open space. This development also provides power back-up for emergency situations, swift elevators, efficient car parking and 3-Tier security for total safety. Located at Electronic City, a prime location in Banagalore, Ajmera Stone Park Electronic City comes in close proximity to a number of your daily and emergency places, providing ample convenience that will always keep you happy and content. Places likes schools, colleges, malls, shopping centres, supermarkets/hypermarkets, general stores, banks, ATMs, medical centres, hospitals, cafes, restaurants, pubs, IT parks, public transport and a lot more can be accessed within no time. Starting at a price of Rs.51.06 lakhs and gradually moving up to Rs.68.16 lakhs, the Ajmera Stone Park price is affordable and well-planned to meet your budget perfectly. This is where you can experience a life of premium luxury without a heavy load on your wallet. There are several payment plans that you can choose from according to your convenience along with home loans through associated banks, NRI services and more. Purchase a luxury apartment has never been this simple! Vitrified tiles 800x800mm for entire flooring of living, dining & bedroom. Antskid tiles for all utilities, balconies & terraces. Wooden flooring in master bed. Cladding with designer tiles up to 2 ft height above kitchen platform. Interior: Acrylic Emulsion, celling & wall-white paint. All internal walls are plastered with lime rendering and water proof birla putty pinning.